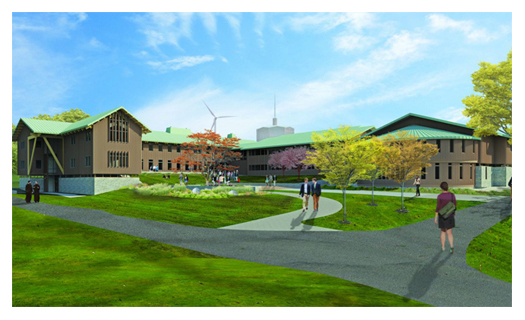 Keough is currently providing the Portsmouth Abbey School with Owner’s Representation Services for the new state-of-the-art science education building. Keough has worked with the school during the Design and Pre-construction phases of this project, and continues to assist the Portsmouth Abbey School during the current construction phase. The new Science Center will be the largest single initiative in the School's history and will adhere to most of the highly efficient low-emissions green standards. It will house seven laboratories, seven classrooms, faculty offices, a multi-purpose seminar room, and a multi-story science & humanities commons that will serve as the crossroads of the two disciplines. The Portsmouth Abbey School Board of Regents is proud to announce the largest single initiative in the School's history - a new science facility, which will secure the academic future of Portsmouth Abbey School as a school that continues to deliver an exceptional education in the sciences and humanities. The state-of-the-art science education facility will be annexed to the east end of the Burden Classroom Building, extending from the Holy Lawn north toward the football field and track. Design and construction plans have been completed by Architerra, an architecture, community design, and development advisory firm in Boston, dedicated to sustainable design and smart growth. The new building will include seven laboratories, seven classrooms, faculty offices, a multi-purpose seminar room, and a multi-story science & humanities commons that will serve as the crossroads of the two disciplines. The wood and steel-framed structure will complement the existing Belluschi architecture on campus and adhere to the highly efficient low-emissions green standards that began with the building of St. Brigid's House in 2007. Its eco-friendly components will meet LEED Gold design specifications, and its flexible-use interior will ensure that the School can remain abreast of the rapidly-changing academic landscape in the sciences.